Curated by Rahul Mehrotra, Ranjit Hoskote and Kaiwan Mehta, the exhibition The State of Architecture: Practices and Processes in India opened at the National Gallery of Modern Art, Mumbai in January, 2016. For 12 weeks, the exhibition was to be the home for a diverse range of activity hosted by the Urban Design Research Institute. The narrative of the exhibition structured the show into three zones: statistical, chronological and survey. 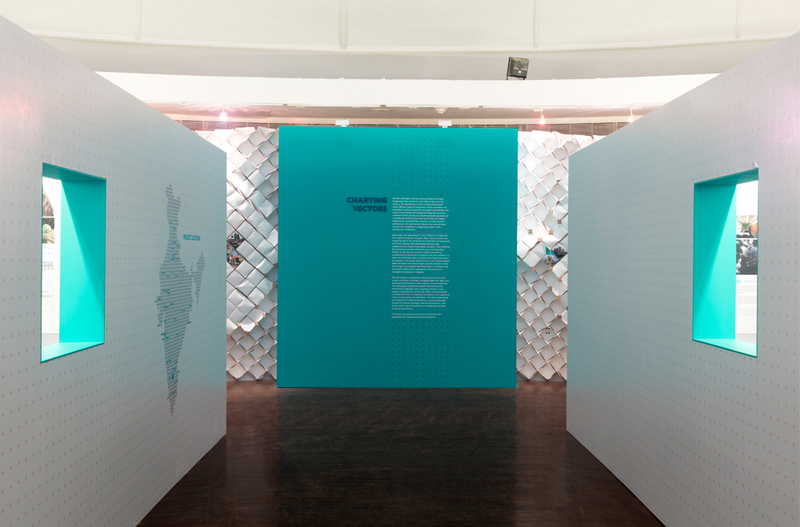 In response, our visual systems were applied to each zone as distinct experiences: information graphics applied across the physical space, a graphic timeline following the curves of the wall surfaces and a maze of curated projects representing the diversity of contemporary practices. The graphic system of plus signs and typography created for the project developed further within the space, working at contrasting scales, providing contextual backgrounds for some ideas and acting as highlights for significant historical events. Through the exhibition, large-scale architectural photographs provided counter-points to historical images, offering moments of intimate viewing as well as collective questioning. The exhibition space was designed as a venue for discussion, discourse, screenings, conferences and events, serving students, professionals and the general public alike.